With the upcoming changes, it is now even more important to make sure you are using the proper adjuvants to ensure your herbicide application is as effective as possible and to help minimize the development of herbicide resistant weeds. A spray adjuvant is a broad term encompassing any product added to the spray tank to help increase herbicide performance. Adjuvant products can take a number of forms, including surfactants, water conditioners, defoamers, oils, drift control agents, or any combination of these. Adjuvants are a critical part of a crop protection strategy because they help ensure herbicides work as effectively as possible, ultimately protecting the grower’s investment. Today, herbicide effectiveness is more important than ever. Currently there are a number of weed biotypes that have become resistant to some of the existing herbicide technology. As a result, the ag industry has developed new herbicide technologies to help control resistant weeds and minimize the spread of these biotypes. In addition new trait technologies have been developed to create varieties that are tolerant to the new herbicide technologies. In fact, industry experts estimate up to 20 million acres (1 in 4 U.S. soybean fields) will include these herbicide tolerant traits during the 2017 season and up to 70 million acres will include these traits over the next five years. Because of these anticipated adoption rates, it’s important to know what the different adjuvant characteristics are designed to accomplish, and the best available options. Since most adjuvants are applied as a foliar application, it’s important for the spray droplet to spread out evenly to wet the entire surface area. Surface area is critical, as it increases the physical reach of the herbicide on the plant. It’s important to strike the right balance with a surfactant. Using too much can cause runoff that decreases effectiveness of the herbicide as well as crop injury. Molecules in hard water can bind with active ingredients in herbicides, potentially lowering the effectiveness of the product. Agents that act as buffers can alter the water pH and create a stabilizing effect in the tank. Adjuvant products that contain defoamers can reduce the amount of foam that certain herbicides generate within a spray tank, making the application process smoother. Adding an oil component can help the herbicide penetrate through a weed’s waxy exterior. Drift control agents can help adjust the overall droplet spectrum to minimize off-target application. Droplet size has a direct impact on a spray’s drift potential. Smaller droplets are more likely to drift off target and potentially damage neighboring crops or vegetation. Read your herbicide label carefully, every time you use it and always follow the label instructions. Formulations can change even within the same product, and the changes may alter which types of adjuvants are recommended for use with specific products. 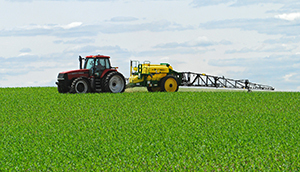 Use adjuvants that are specifically developed for agricultural uses. Products developed for industrial use will not work, and may even hurt the quality of the herbicide. Use adjuvants with characteristics that will help your herbicide be the most effective, but avoid mixing products together without doing a compatibility test. Even if a specific operation could benefit from the combination of a surfactant and a defoamer does not mean two separate products are compatible together or with the herbicide product. Conduct a test first, especially if you’re unsure about your product combination. Jar tests or other methods of mixing can save you from having to clean sludge out of your tank. Check to make sure the adjuvant is approved for use with the new herbicide. Check the product’s website for a list of approved adjuvants and learn as much as you can before using the product. Talk to the experts. With the new herbicide and trait technology rapidly approaching, retailers and other agronomic professionals should communicate with their distributors to determine when to use a specific product. Working in tandem with emerging technology designed to battle resistant weeds, CHS has a new line of Pro Adjuvants to help maximize the effectiveness of your herbicide and work along with the new herbicide technology, while helping growers maintain stewardship with better drift control and lower volatility. For more information contact your CHS Agronomist today.